The idea for the All the Ballparks Road Trip began when my dad and I were driving cross country from D.C. to Tucson in May 2008 when we began dreaming about a real road trip where it was more about the journey than the final destination. That road trip dreaming involved visiting all the Major League Ballparks in a single summer. Really you can trace this dream a little further back to a small scale road trip we did to the Midwest in the summer of 2004, which involved us touring Busch Stadium (the one they knocked down when they were still working on the current one), seeing a game at Great American Ballpark, and seeing a game at Wrigley Field. During that same summer we also did our normal going to Bank One Ballpark (now called Chase Field) when the Cubs came to town and seeing a game at the then very new Petco Park. Since that summer I in particular have dreamed of one day being able to say I have been to a then current ballpark for all the major league teams. 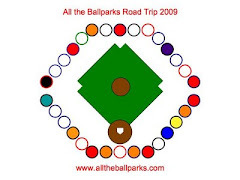 So, back to May 2008 when we decided we should do All the Ballparks in one road trip. By the time we got home on the D.C. to Tucson road trip I had made a tentative route to do it. As soon as we got home we brought up the dream to my mom (the financier) and my younger brother (the third road tripper). My mom's reaction was along the lines of "Sounds cool. Too bad its too long for me to come with." My brother also thought it was cool, but was like we are taking the motorhome, right? Well, sure the motorhome sounds like a fun road trip way to go, but we are back to the days of roughing it. He was still on board with the idea, though, when we explained it was totally an unrealistic trip to take if we had to pay for gas for the motorhome. Instead we are going to take Dad's Yukon or do Dad's idea of buying a used Honda Element and selling it when we get home. We will mostly be roughing it by sleeping in the car and/or camping and maybe occasionally using Mom's hotel points to stay at a Hilton or Hyatt (yeah, that would not be roughing it, but it would not add to the trip expense). So, by now (at least to my dad and I) the All the Ballparks Summer Road Trip 2009 is going to happen. I will try to keep this blog updated with our latest plans and preparations. When we actually do the road trip (may not be 2009, but we will do it one of these years for sure) I plan to post regular updates of our adventures.